There’s nothing like ‘the gentle thrum of diesel engines’. At least that’s what the local tourist brochure would have you believe as it describes the manner in which the local catamaran pulls away from the shore on its nightly sunset tour of the Thomson River. Tourist brochures provide a very cheery view of life. I must remeber to try and think like them more often. Its not a noisy stinky diesel engine of the variety most people try to avoid…tis ‘the gently thrum of diesel…’ providing ambience to accompany your red wine. So romantic, if Em were there at the time I might just have taken her out on that that tour and proposed all over again. Still it is spectacular in Longreach. The grassed plains glow around sunset and sunrise. They give way to an irridescent grey sky, which then works its way through various shades of purple and into lighter blue above that. And you can see for what seems like many many miles, at least it does if you jog five km out of town. My urge to run seems to have reappeared with avengance, inspired by so much new territory to explore. Maybe there is a limit to the number of times one can run around the central basin of lake Burley Griffin or summit Mt Stromlo. We also visited the Qantas museum today, including the orignal hangar where Fysh and McGuiness started the whole enterprise. I do enjoy staring history in the face. It seems that every town for hundreds of kilometers around stakes a claim to the birth of Qantas. 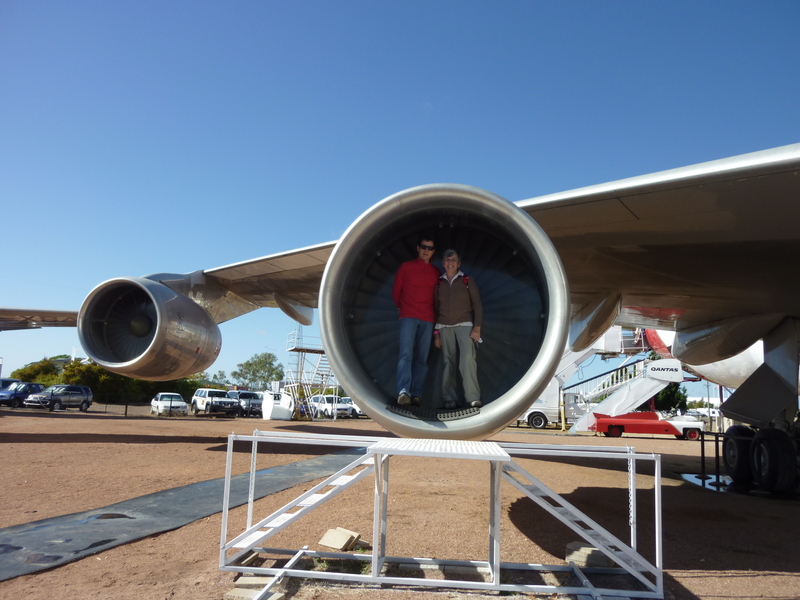 Bit hard for all other than Longreach to compete though with that 747-200 Sitting on the outskirts of town. Speaking of which mum and I mused, as we toured, whether this particular plane was the one that flew our family to the USA back in 1978. Our hopes were dashed though when realising it had been commissioned in 1979. Since then it had only spent ten years in the air. Litterally in the air. It was in service for 23 years and flew 82.5 million kilometers. But that’s nothing, we have already driven 1700! Next I love tail winds!